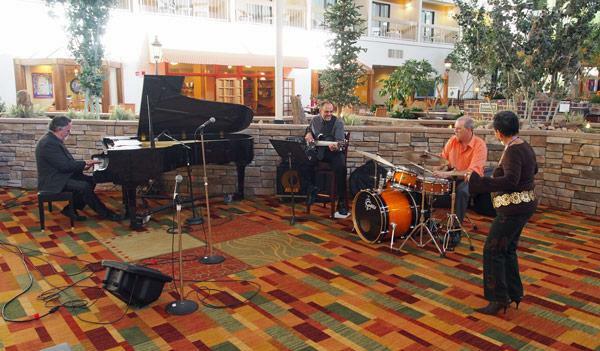 We end this show report as we started, with a photograph (this time by John Atkinson) of singer Lillian Boutté, who both opened and closed the RMAF with her band Eric Gunnison on piano, Mike Marlier on drums, and Mark Simon on bass, in the Denver Tech Center Marriott’s Atrium. Wired with Transparent cables, the extreme audio system in the large room at the Denver Tech Center HyattdCS Vivaldi digital source, VTL TL7.5 III preamp, VTL Siegfried power amps, Wilson Alexandria XLF speakers driven full-range and twin Thor's Hammer subwoofers driven by 250Wpc Parasound Halo A 21 amplifiers below 38Hzworked its magic both on the disco-meets-EDM of Daft Punk's "Lose Yourself to Dance" and the delicate harmonic traceries of Dave Wilson's Debussy violin sonata recording transferred to DSD by Puget Sound's Bruce Brown. In both cases, there was a sense of loss when the music stopped. It is difficult to imagine how music reproduction could get any better than what I heard in this room the Saturday afternoon of the show! 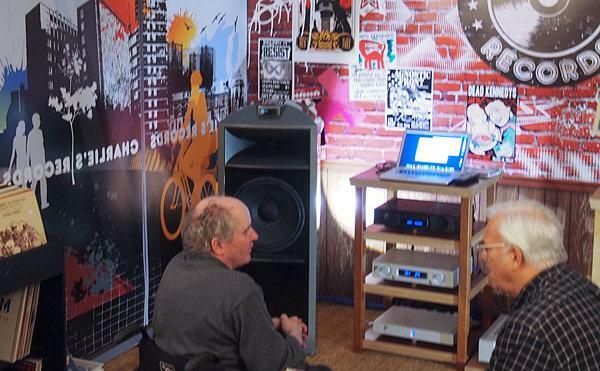 Ray Kimber always gets great sound at shows, but this year, although he was still using four Sony SS-AR1 loudspeakers hooked up with Kimber Select cables and an EMM DAC to play his four-channel IsoMike DSD master files, there was something extra-magical happening in the room. Both pianist Fan-Ya Lin's album Emerging and the Romantic Album from violin and piano ensemble the Formosan Duo, sounded tangibly real. 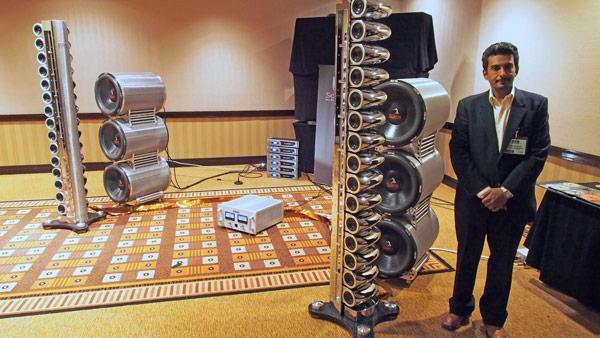 The key, it turned out were the gigantic, 300lb MTRX class-A/B monoblocks from EMM Labs, can be seen in my photo. This brute will output 1500W into 4 ohms and, in Ray Kimber's words, extracts "cheerful obedience" from the speakers it is tasked to drive. 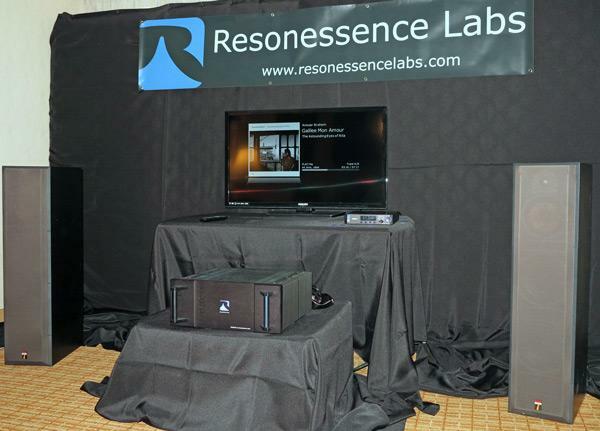 Resonessencewhat a great name for the equipment that closed out my three days of blogging RMAF 2013. Happily it sounded really good as well, especially when JA pointed out that the reason this simple system’s top at first seemed rolled off was because the only way to align our ears with the tweeters of the 20-year old, unusually short B&W mini-towers was to either crouch way over or kneel on the floor. 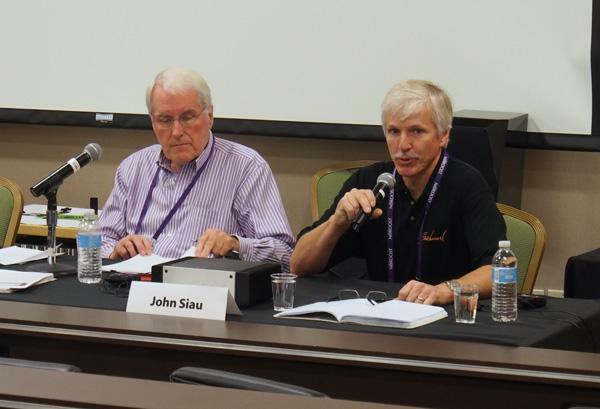 John Siau of Benchmark (right) and Laurie Fincham of THX (left) gave a provocative presentation on the final morning of the show, entitled "Why Most 24-bit Audio Systems Still Deliver 16-bit Performance." The thesis was that even with D/A processors capable of operating with a dynamic range >20 bits, there is still the resolution bottleneck imposed by the amplifier. As I have pointed out in Stereophile's reviews, amplifiers with a sufficiently low noisefloor and a sufficiently large maximum voltage swing to equal hirez audio's dynamic range are a) rare and b) necessarily expensive. 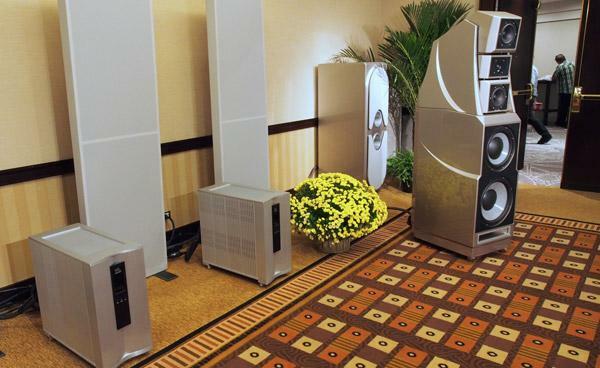 Benchmark, using the unique, high-efficiency amplifier modules designed by Laurie Fincham, Owen Jones (the twin brother of TAD's Andrew Jones), and Andrew Mason, that I wrote about in my 2012 CES report, aims to address both those issues. Bel Canto's John Stronczer was excited. "The Powerstream amplifier's S/N ratio is 120dB measured at the speaker terminals!" I was impressed. 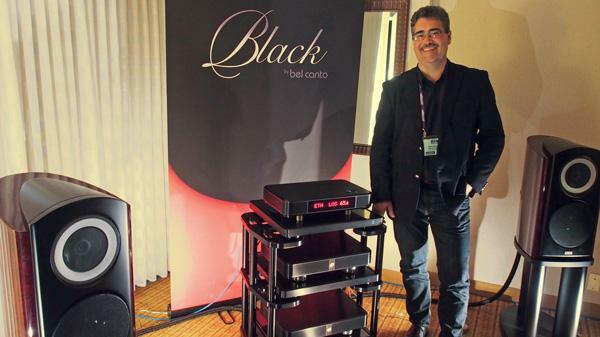 This is equivalent to 20-bit digital audio, which means this digital-input monoblock, which costs $15,000 each, is one of the quietest amplifiers I have encountered. It offers 300W into 8 ohms, 1200W into 2 ohms. Audio data presented to the ST-optical inputs are reclocked and then converted to analog with a BurrBrown PCM1792. The analog signal is then fed to an output stage based on the well-regarded Hypex class-D modules, used in a proprietary low-gain configuration to maximize dynamic range. 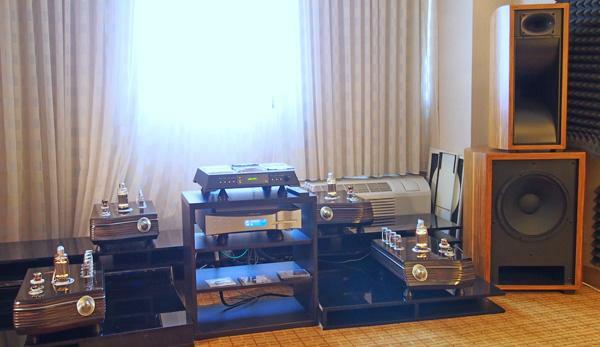 Listening to Scaena's Silver Ghost speakers ($153,000/system) had been a highlight of last March's AXPONA in Chicago. At the Denver Tech Center Hyatt, the speakers had been set-up by Sunny Umrao (in photo) firing diagonally across a much larger room than in Chicago. 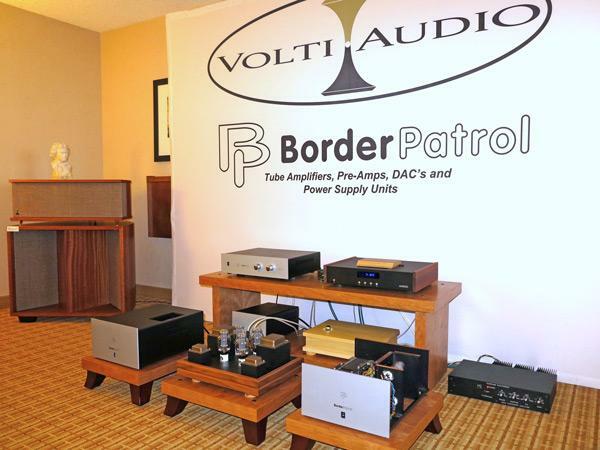 With a system comprising a dCS Vivaldi digital source driving an Audio Research Reference 75 stereo amplifier for the towers and six inexpensive Crown class-D amplifiers for the six woofer modules operating below 120Hz, the sound of a live recording of Dave Brubeck's "Rondo a la Turk" did indeed sound live. Very clear and open sound, with a shiny treble and lovely midrange distinguished the room that partnered four lithium battery-powered componentsa Kronos turntable ($32,000) outfitted with Lyra Atlas cartridge and Black Beauty tonearm, Veloce’s Platino Series LP-1 phono stage (NLA), Lithio Series LS-1 linestage ($18,000), and Lithio Saetta 400Wpc monoblock amplifiers ($18,000/pair)with YG Acoustic’ Kipod II loudspeakers ($38,000/pair) and Kubala-Sosna Emotion cabling. Sergey Sorokin, who deserves kudos as Russia’s first high-end manufacturer, arrived at the Marriott Denver Tech Center from Moscow a day before other exhibitors to ensure that his set-up was as close to ideal as the room allowed. Nonetheless, as John Atkinson and I learned upon listening, one of his Israeli-sourced, hand-wound transformers was damaged in transit, and insisted on humming/buzzing along with the music. Despite the unexpected accompaniment, the voice of Lorraine Hunt Lieberson singing Handel (Avie SACD) exhibited absolutely gorgeous tonalities. The great artist’s hushed sounds, even through the transformer noise, were something special. The period instrument orchestra’s bass foundation was also solid and superbly rendered. By the time I reached the Tower’s 11th floormy final floor, thank Godat 5:35pm on Saturday, I had been at it for over 8.5 hours, and my cold and fever were at their peak. It felt as though nothing short of the Balm of Gilead could bring me solace. But when I heard, in succession, impressively full-range sound and excellent low-bass definition on Mahler’s Symphony 2, and gorgeous warmth and color on everything soprano Arleen Auger sang, I felt as though I could simply float through the rest of the day in a state of peace. How wonderful to finally catch up with Scott and Paul McGowan, and to discover how good PS Audio’s prototype class-D amplifier with Hypex modules sounds in its temporary housing. 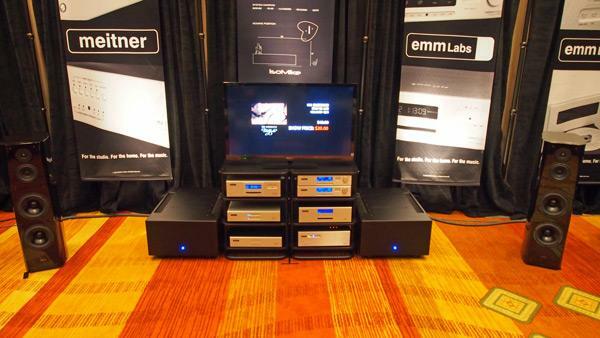 Equally exciting was the just-launched NuWave Phono Converter (NPC, $1895), which combines a phono stage with an A/D converter that can archive LPs in both PCM and DSD formats. Paired with Von Schweikert VR-35 loudspeakers ($10,000/pair) and a custom subwoofer, the system delivered impressive deep bass on a track from Turkish artist and DJ Mercan Dede’s Breath, and lots of color on a track by Chesky artist Marta Gomez. 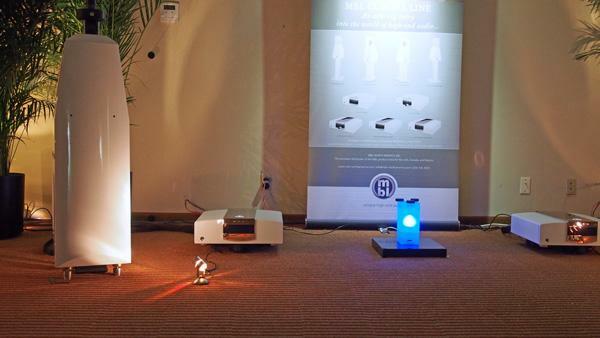 Artist Jay Paul Apodaca and his lovely wife, Houda Alaoua Apodaca, were rocking out with Roksan UK’s Oxygene touch-sensitive, Bluetooth-equipped integrated amp ($7000) at the world premiere of its limited edition Jay Paul Apodaca incarnation. As the story goes, Roksan’s owner, Tufan Hashemi, visited Jay Paul’s store in Detroit and began collecting his art. Eventually he decided to commission Jay Paul to make 12 original paintings that he could reproduce on the front of the Oxygene. Mated with Roksan’s Darius S1 loudspeaker, the artwork and system livened up the Marriott’s Tower like few other systems I heard. 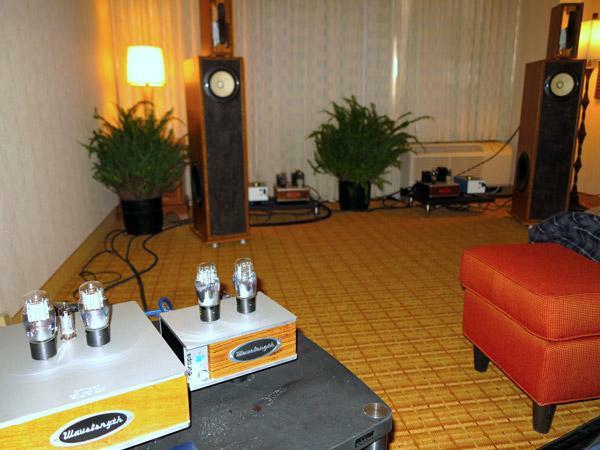 At the 2012 RMAF, Ayre Acoustics had decorated their room in the Marriott's tower to resemble a 1950s bachelor pad, complete with lava lamp. This year, the theme was Charlie's Records, complete with racks of bargain LPs offered for sale. 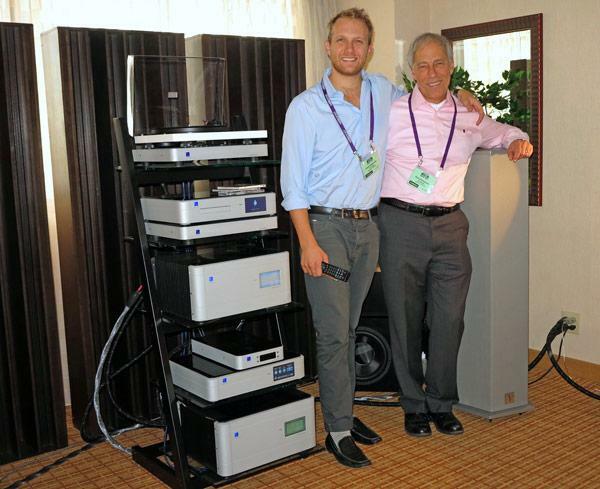 It was great to see Ayre founder Charlie Hansen (left, above) back in action at a show, after a long hospitalization. 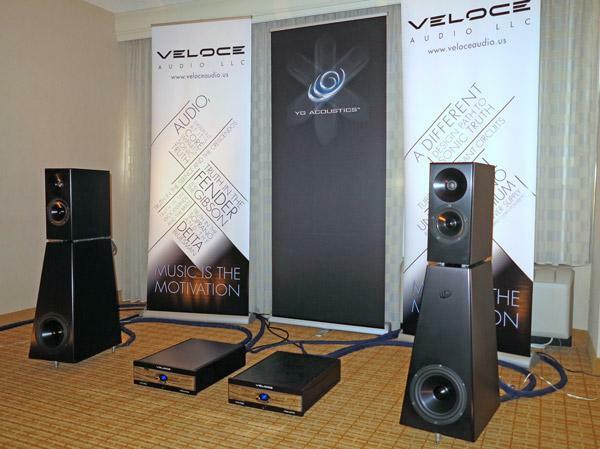 The system featured JBL K2-9800SE speakers driven by Ayre's VX5 power amp and KX5 preamplifier, with source either an Ayre DX5 universal player or an Ayre/Bauer DPS turntable amplified by an Ayre P5 phono preamplifier.